So you and your significant other have been dating for quite a while now, and you’re ready to take that next step in your relationship. You ask her parents for permission, you buy the ring, and all of a sudden, you’re completely blank. 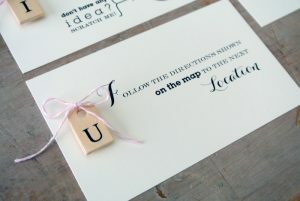 You have decided to propose, but how and where are you going to propose to her? The cliched ‘ring in the wine glass’ or ‘ring in the cake’ or ‘propose in a romantic restaurant’ have all been played out. Make your girl feel special, by proposing to her in a unique way. Can’t think of any? Well, that’s what we’re here for. 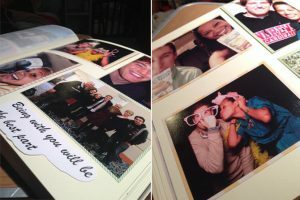 Randomly gift her a photo album with all your favorite memories and photos together. 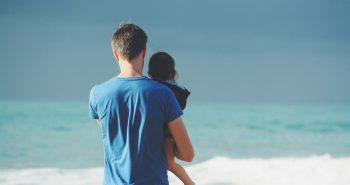 It should have all important milestones in your relationship like the place you first met her, the time when you asked her out, the places where you had special dates, your first trip, etc. And at the end of the album, write a special note about how much she means to you, and then keep the ring on the last page. She will definitely say yes! A public proposal can be extremely romantic if you plan it properly. Go down to your most frequented movie theater and tell them about your plan. Tell them to play her favorite romantic movie’s favorite scene and when the guy finally gets the girl, go down on one knee and ask her if she wants to spend the rest of her life with you. Everyone will cheer you and you will be as happy as the guy in the movie when she says yes! When a girl is proposed to using merchandise from her favorite TV show or movie, it is a guaranteed yes. Imagine proposing to her using the ring from Lord of the Rings, or hiding the ring inside a Snitch from the Harry Potter series. 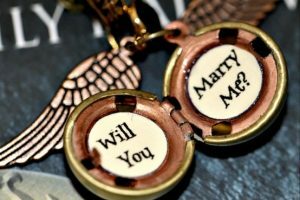 Or opt for a Game of Thrones-inspired proposal to win her heart. Either way, using merchandise for proposing is a unique way to make your girl feel extremely special. Proposing to her with a gift and hiding the ring inside the gift is one of the unexpected ways to propose. You could gift her a book and hide it inside the bookmark, you could gift her flowers with the ring hidden inside a note, you could gift her a dress and hide the ring inside the collar. 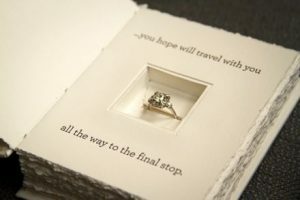 In any case, adding a gift to the proposal increases her happiness over the proposal. Why not add a tinge of adorableness in your proposal? 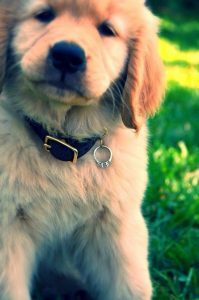 Get a cute puppy or kitten for the proposal and put the ring in the collar of the pet. Cook her favorite meal, set the table and set the mood for the proposal. Take your friend’s help in getting the pet ready and hide it until the time of the proposal. Then bring out the puppy or kitten and while your to-be fiancee is gushing over the adorableness of the little pet, she will find the ring and be surprised and extremely happy. Granted, not every celebrity will be willing to help with proposal videos, but you might just get lucky. Reach out to some of her favorite celebrities and ask them to send a video of themselves to your girl in which they talk about how much you love her. 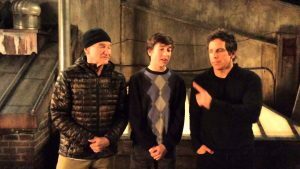 You can also ask them to star in a proposal video with you, like a guy famously did with Robin Williams and Ben Stiller to propose to his girlfriend and ask her to prom. The entire set-up will completely bowl your girlfriend over because of the efforts you took to make her feel special and unique. Well no, there are no time machines invented yet, but you can go back to the places which served as important milestones in your relationship. The place you went on your first date, the place you first kissed her, the place you went for your first movie, etc. can be part of your proposal plan. Take her to all those places and remind her of all the important milestones and then take her to an extremely romantic location and add that to the list of your milestones by proposing to her there. Adding nostalgia to the moment will definitely add romance to the moment. To add mystery and fun to the proposal, do a mini scavenger hunt for her to find the ring. Start at her place and lead her through many places with different clues and finally end at a location you both love and propose to her there. The entire process will definitely pique her interest and she will love the efforts you took to organize the entire thing for her. The proposal will be one to remember and to tell the grandkids. 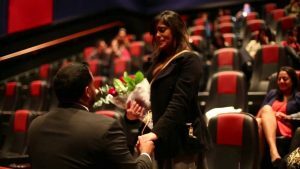 A unique movie-type way to propose is with a flash mob. Organise a flash mob with complete strangers over the internet and choose a public venue for the proposal. 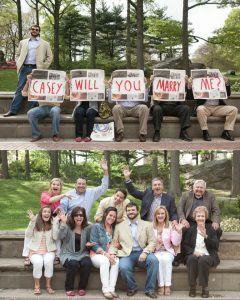 In the end, let selected people in the flash mob hold up letter boards spelling out ‘Will you marry me’. It will catch her completely off-guard and surprise her beyond words. 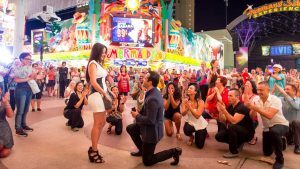 Flash mob proposals are trending right now, and there are many organisations that cater to your demand for a romantic flash mob proposal. 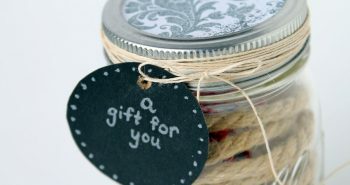 To make the engagement a bigger affair, involve all your friends in giving your girl a surprise. They can help out with the decoration and the theme and the cake, while you work on keeping her distracted till the main proposal. You can finally propose to her with all your loved ones beside you, and an added advantage is getting photos of her genuine reaction to the proposal. Organising a surprise proposal party with all your friends also gives your friends the opportunity to share in your happiness. 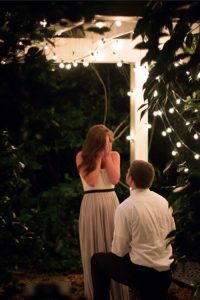 Proposals are one of the biggest parts of a woman’s life, and she dreams of getting proposed to in a very romantic manner. In order to not let her down, use one of our unique ideas or customise your own. No matter what manner you choose to propose to her, ensure that it is extremely romantic and it will be something that she’ll remember for the rest of your lives together. Your proposal should mark the amazing and romantic start of one of the life-changing adventures that you are about to embark upon with your significant other- marriage.